The SHIELD deal is only good on the 16GB version of the device. It retails for $200, so it's $180 at checkout. The Cardboard discount is $5 on either the single or two-pack. That drops the prices to $10 and $20, respectively. 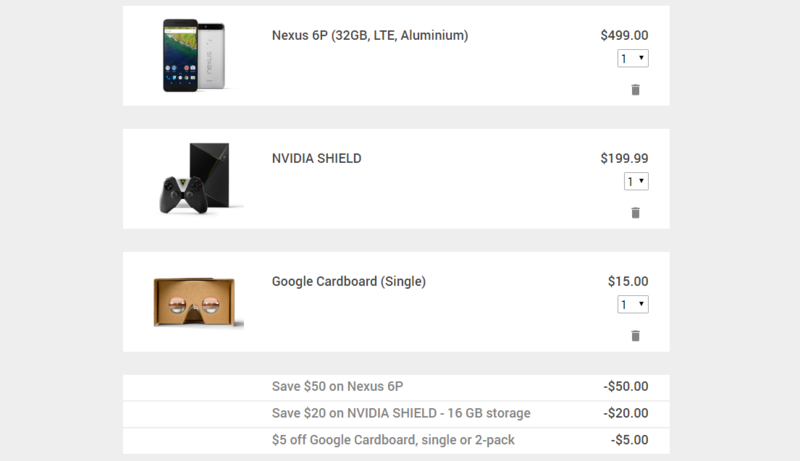 The best of Google's new deals is another $50 discount on the Nexus 6P. You can get the discount on any variant of the device. So, the cheapest is $450 for 32GB and the most expensive is now $600 for 128GB. All three deals are valid through late June, but they're all different days. The Cardboard deal is over on June 17th, the SHIELD discount ends June 18th, and the 6P ends June 19th. The Acer Chromebook R11 is also on sale for $30 off, bringing the price down to $249.99. Deal ends June 17th.